Scenery: Narelle Sissons, Costumes: Barbara A. Bell, Lighting: Michael Giannitti, Sound: Ryan Rumery, Production Stage Managers: Kelly A. Borgia & Melissa Daroff, Casting: Pat McCorkle CSA, Joe Lopick McCorkle Casting LTD. The play A Raisin In The Sun ends with great hope for the future when the Youngers, a black family, buy a deeply discounted house in a middle class white neighborhood. Karl Lindner, who has tried to convince the Youngers that they would be happier living "in their own" community is the sole white character in that play. Clybourne Park, is a continuation of, and in a sense, an answer to A Raisin In The Sun. Playwright Bruce Norris has switched perspectives and in the second act taken the audience 50 years foreward in time. 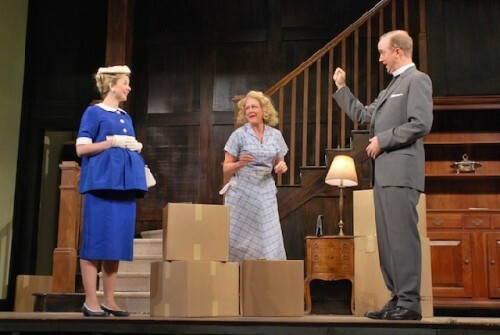 The first act of this play takes place in 1959 in the house that the Youngers have purchased. Karl Lindner, a representative of the neighborhood association, is the same character as he was in A Raisin in the Sun. 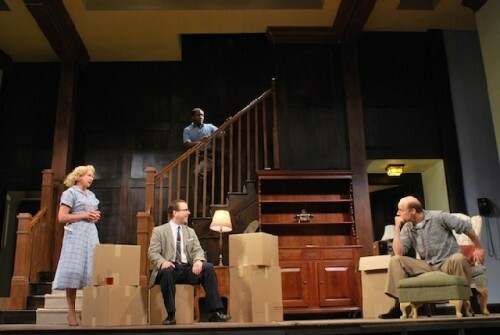 Clybourne Park begins as the white couple is packing to move out of the house. The second act of Clybourne Park takes place in the same house, 50 years later. The house, which has badly deteriorated and is now in a predominantly African American neighborhood, has been sold to a white couple who are planning to demolish it and build a taller, larger house. The representatives of the neighborhood association, who are black, and their lawyer are meeting with the white couple and their lawyer. The neighborhood association opposes the demolition. They want to maintain the history and character of the neighborhood. Clybourne Park is a play about the intersection of property and race in our history and our present day, and our inability to communicate across a continuing racial divide. It is also about the dichotomy of change: the disruption of memory and history playing against dreams and hopes for the future. These are the weighty concepts presented in this darkly comedic play. Although the Pulitzer prize-winning Clybourne Park is widely praised, I found it, even as presented in the Dorset Theater's excellent production, disappointing. It is a surface treatment of the continuing tensions between the races, the problem of gentrification, and the dynamics of change. Though the language, when parsed as literature, explores worthy concepts, a play must rely on plot, action, and emotion to communicate. As a play, rather than a piece of literature, I felt it was unsuccessful in connecting with the audience. The characters are written as broad stereotypes, without the aid of nuance to illuminate their disparate motivations and so bind the audience to them. Each act follows the same arc beginning with silly or dispassionate conversations that devolve into the dominant emotions of anger and resentment and escalate to a vitriolic climax, including, in the second act, nasty racist jokes. There is no sense of a plot moving forward and the play is almost totally devoid of physical action. The Dorset Theatre is to be commended, however, in bringing this very new play, which deals with difficult subjects, to their audience. The pace is spirited and the staging solid. The acting is especially strong, with each actor playing a different character in each act. Carol Halstead as the vacuous Bev in the first act and the level-headed lawyer, Kathy, in the second is thoroughly convincing in both roles, as is Remi Sandri as the depressed Russ in the first act and the earthy contractor, Dan, in the second. Lynnette Freeman plays the diffident housekeeper, Francine, with grace and self-restraint in the first act and renders a self-confident and fiery Lena in the second. Greg Jackson's two characters, Karl and Steve, humorously and unsuccessfully search for euphemisms and obfuscatory language to avoid direct communication in both acts. 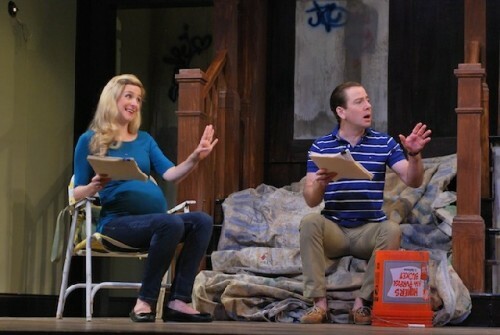 Clea Alsip adds a spark of comic relief as the deaf and very pregnant Betsy and is appropriately grating as the self-absorbed second act character, Lindsey. The crisp, well-ordered costumes of 1959 are followed by the varied outfits of our modern time, with the contractor's appearance in his sweaty, grimy, working man clothes, being such a contrast from his appearance in the first act, that it prompted a welcome laugh. Clybourne Park does raise important questions. It gives us a version of what might have been the future of the fictional neighborhood created when the Youngers crossed the color line. It is a subject worth contemplating, but I don't agree that this version is accurate. 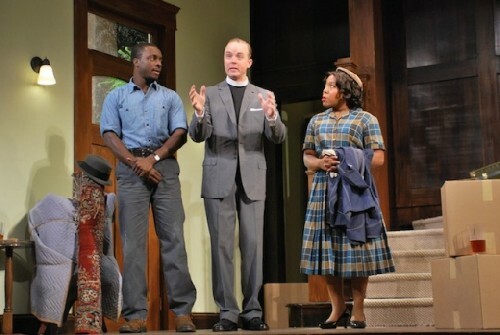 I urge you to reread A Raisin in the Sun by Lorraine Hansberry and then see this production of Clybourne Park. How far have we come? And how do we keep moving toward the dreams of Lorraine Hansberry who said, “Write about the world as it is and as you think it ought to be— if there is to be a world.” I don't believe that the future she looked toward with her play has arrived, but that it is an ongoing work in progress.